Yesterday Bookworm2 kept asking if I'd read a book of his choice to him (we were in the middle of reading several books for school) and I consented (because it was probably the least I could do). He said he wanted to read "the cat book" and brought me our copy of Anatole and the Cat , by Eve Titus. It had been awhile since we had read it and I was glad to revisit it. 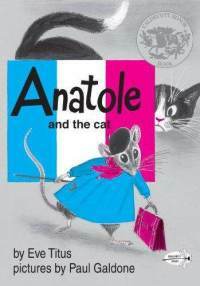 In Anatole and the Cat , Anatole is having trouble working his job at the cheese factory because there is a cat on the loose who is distracting him from his duties. Now, no one else at the factory knows that Anatole is a mouse. He works at night when all of the other workers go home and the owner of the company, M'sieu Duval, communicates with Anatole through memos. Anatole has a nose for good cheeses and Duval relies on this late night worker to leave memos about how he can improve his varieties of cheese. Because of Anatole's suggestions, Duval's cheeses are the most loved in all of France! Anatole is therefore a valuable worker and it behooves M'sieu Duval to help solve the cat problem so that his employee will be able to do his work properly. It was after Anatole that Titus began writing the Basil of Baker Street series. Needless to say, my Amazon wishlist just grew a bit larger and I'll be browsing used bookstores for the rest of the Anatole books. They are charming, being scattered about with French words and phrases (so if you are studying France with your kids, this is a great series to explore!). The books as a whole apparently also express the value of hard work and that is something that children today can definitely stand to think more about. The particular story that we own is complex and interesting, both for adults as well as children. All in all, Anatole is a treat and a delight to read and we highly recommend them (to you and to ourselves - as we chase after the stories we have yet to read)! It's always fun to discover that there are more books available by one of your favorite story tellers. Happy thought indeed! I used to collect all things French, and I know I used to have Anatole Over Paris. Alas, I think I passed it on with most of the rest of my collection. These look like fun! I'm off to see what my library has. This is new to me but looks great! Somehow I missed this post while on vacation. My second daughter loves all things mouse, so I should try to find these for her.